CarGurus has 11,405 nationwide Escalade listings starting at $1,999. Popularity is a fickle thing, and Cadillac’s luxury-laden 2016 Escalade full-size sport ute is a case in point. This 7- or 8-passenger 5-door high-end ute gets a number of improvements for the upcoming year, but whether this will be enough for niche-topping status remains to be seen. There are just too many competitors offering even further upgrades, not to mention better agility, diesel engine choices, and roomier seats and cabin space. Be that as it may, however, the Escalade remains a solid choice for those who need a monster-size SUV with an abundance of ostentatious posh. Again for 2016, the Escalade will remain offered in 4 trims: the entry-level Base, the up-featured Luxury, the well-wrought Premium, and the uber-opulent Platinum. All trims return toting standard rear-wheel drive (RWD), while each can be delivered with an available driver-selectable 4-wheel-drive (4WD) configuration that boasts a 2-speed transfer case. Also remaining standard across the 2016 lineup will be an adaptive suspension system boasting a pair of selectable modes, Sport and Comfort, with the latter often referred to as “Touring” mode. Some marginal changes to this princely people-mover include the replacement of a pair of exterior colors with 4 new paint schemes. Further improvements include stuff like an upgraded Driver Awareness package, an improved Surround Vision system with a new front camera setup, and a new Advanced Diagnostics driver-information function that’s interfaced with the also-improved 12-inch CUE (Cadillac User Experience) display. There are also a few tweaks to the rear-seat Blu-ray/DVD entertainment system that’s standard in higher Escalade trims. This high-end heavyweight returns with last-year’s debuting power-folding third-row seatbacks, while cargo capacity remains a decently spacious 94.2 cubic feet with all rear seatbacks folded. Again for 2016, the Escalade, in all iterations, offers standard second-row captain’s chairs for 7-passenger seating, while an available second-row bench seat opens a spot for one more rider. Standard power for the 2016 Escalade lineup remains the traditional 6.2-liter Flex-fuel V8 engine mated with a now-standard 8-speed shiftable automatic transmission that was introduced late in the 2015 model year. Look again for 420 hp and 460 lb-ft of torque from this hefty 8-cylinder, with mileage figures expected to return estimated at 15 mpg city/22 highway/17 combined in RWD trims, and 15/21/17 in 4WD variants. Maximum towing capacity, meanwhile, is slated to remain some 8,250 pounds. Current appearance features scheduled to return for 2016 include, depending, of course, on the trim selected, 20- or 22-inch alloy wheels, step running boards, a roof rack, heated power-adjustable and power-folding mirrors, a power sunroof, and Caddy’s touted Magnetic Ride Control adaptive suspension with selectable Sport and Comfort modes. Inside, complementing the expected improvements in the upcoming year, look for leather upholstery, heated and ventilated power-adjustable front seats, heated rear seats, full power accessories, and power-folding third-row seatbacks to remain standard. Additionally, a rear-view camera returns in all 2016 Escalade versions, as do the traditional rear parking sensors, remote engine start, and, in the top-shelf Platinum trim, massaging front seats and a cooled console storage box. Techno-goodies adorning all 2016 Escalade iterations include the upgraded CUE infotainment system that now sports the brand new driver information function, along with the 4G LTE mobile WiFi capability that was introduced in 2015. And, of course, Bluetooth-interfaced OnStar Directions and Connections services also remain integrated into the system for next year. Furthermore, expect the 16-speaker Bose premium audio system, boasting a CD/MP3 player, HD radio, satellite radio, and an auxiliary audio input to return lineup-wide in 2016, with higher Escalade trims also slated to return toting standard rear-seat DVD/Blu-ray entertainment. Again, lower-level Escalade variations can be upgraded with a number of available features that come standard in higher trims, while the Premium and Platinum editions again remain eligible for available power-folding side steps with approach lighting. Safety-wise, all 2016 Escalade trims are expected to carry standard 4-wheel antilock brakes (ABS), traction and stability control, front side-mounted airbags, 3-row head airbags, and a unique front center airbag, as well as daytime running lights, turn-signal-integrated mirrors, and OnStar emergency alerts and communications. Also expected back are the standard post-collision safety system and remote antitheft alarm of past versions, with higher trims adding blind-spot warnings, lane-keeping assist, adaptive cruise control, front and rear collision mitigation braking, cornering headlights, and a windshield-displayed head-up function. The government, by the way, gives the current Escalade its highest 5-star rating in various crash tests, while this posh-laden sport ute has not been evaluated by the Insurance Institute for Highway Safety due to its considerable size. Owners of various current Escalade editions cite a number frustrating experiences with the CUE infotainment functions, which is expected to be at least somewhat improved for the upcoming year, while complaints of cramped and uncomfortable rear seats have also dogged this plush people-hauler. On the plus side, owners laud the Escalade’s styling and wealth of creature comforts, as well as its potent V8 powerplant. Finally, look for the 2016 Escalade to start showing up on dealer lots in the fall of 2015, when fickle fate will again pit this classy Caddy against such rivals as the Lexus LX 350, the Lincoln Navigator, Mercedes-Benz’s GL-Class, and Infiniti’s QX80. 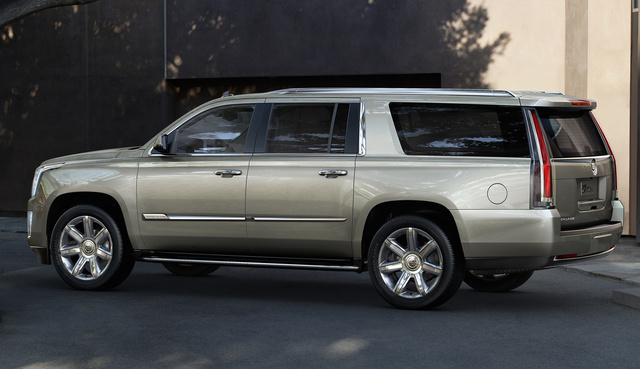 What's your take on the 2016 Cadillac Escalade? Users ranked 2016 Cadillac Escalade against other cars which they drove/owned. Each ranking was based on 9 categories. Here is the summary of top rankings. 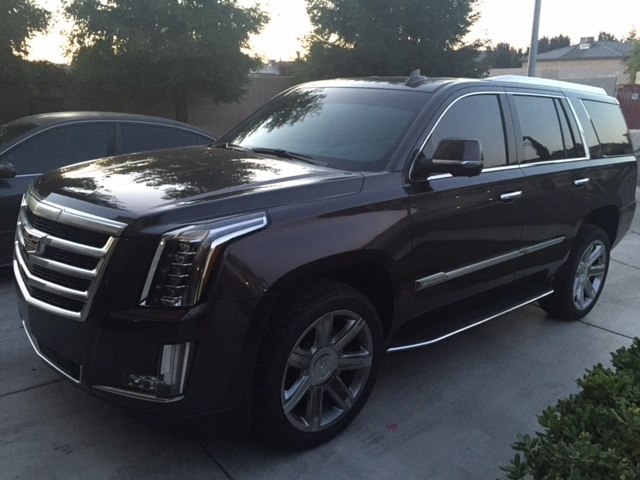 Have you driven a 2016 Cadillac Escalade? My runner boards will not come out when doors open..
Who Has 0% Financing On Cadillac Escalade?